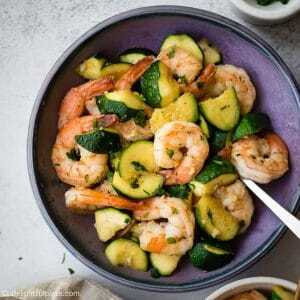 This sautéed shrimp with zucchini showcases natural sweetness of shrimps and zucchini. The addition of garlic and lemon juice makes the dish flavorful and delicious. It is a quick and easy one-pan meal for busy days. 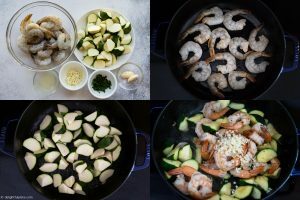 Few and simple ingredients: you need shrimp, zucchini, garlic, lemon, olive oil, salt and pepper – only 7 ingredients. 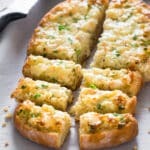 Two optional ingredients to enhance the flavor are parsley and butter. One pan meal: you only need to use one pan to cook it. It’s easy to make and it takes 15 minutes to prep and cook. Yes, very fast! 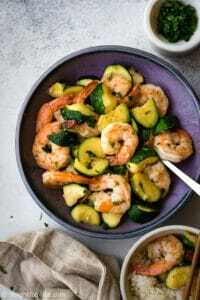 It’s delicious with the natural sweetness of shrimps and zucchini. 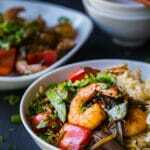 Shrimp cooks really fast and goes well with a lot of vegetables in stir-fry. That’s why I usually have some shrimps in the freezer for those busy nights in the week. 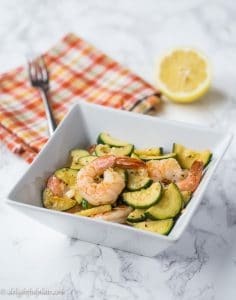 This sautéed shrimp with zucchini comes together very quickly so it’s best to have all ingredients ready before cooking. 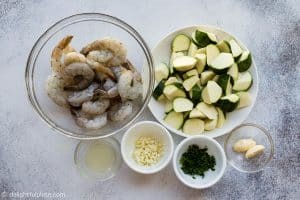 My recommendation is to roll-cut the zucchini to match the thickness of the shrimps. That way, the zucchini soaks up the flavor better while retaining a crisp texture. Roll-cutting is a great technique to prep cylindrical vegetables for stir-fry and stew. 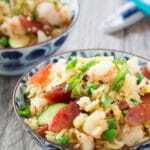 In this dish as well as in many other stir-fries, we cook the protein and the vegetables separately. 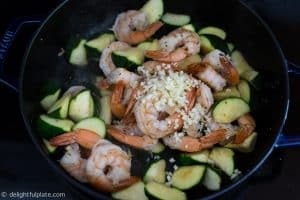 After that, we sauté shrimp, zucchini and garlic together to add that garlicky flavor. Before finishing, we add lemon juice to brighten the dish. Finally, throw in butter and parsley (if using) with plenty of black pepper. The recipe was originally published on May 22th, 2017. It was updated on July 17, 2018 with better photos and step-by-step instructions. The photo below is the old one I took last year and you can see that it doesn’t do a good job of portraying this dish :). I’d love to hear what you think about the dish, so please feel free to leave a comment. 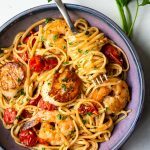 New recipes are added every week so let’s connect on Facebook, Pinterest and Instagram for the latest updates. In a mixing bowl, add shrimps, 1/4 teaspoon of salt and plenty of black pepper. Mix thoroughly. Roll-cut zucchinis to match the thickness of the shrimps. Also prep all other ingredients. Place a pan over medium-medium high heat. 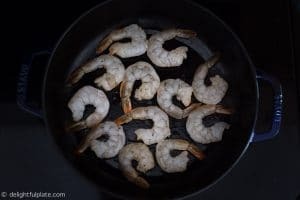 When pan is hot, add oil and then add shrimps in one layer and let them cook undisturbed for a minute. Flip and cook the other side until develop nice colors and shrimps are almost cooked through. Transfer to a plate. 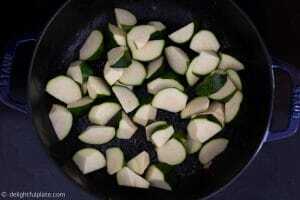 To the same pan, add a little more olive oil and then add zucchini. Sauté, stir frequently for a couple of minutes and add 3/4 teaspoon of salt and pepper (or to taste). Add shrimps back to the pan, and add garlic. Mix and sauté until garlic is fragrant. When everything is fully cooked, pour lemon juice over and add butter (if using). Mix well to combine everything and then transfer to a serving bowl. Sprinkle parsley and serve hot immediately. Some shrimps may be saltier than others, so adjust the amount of salt to your taste. I’m going to make this tonight but add garlic and fish sauce! I’ll let you know how it turns out. Thanks for the idea! I’m sure fish sauce will make it delicious :)!